In honor of Black History Month, I would like to share my story as an American, military veteran and Envoy pilot. I’m blessed to be where I am today, and I owe it all to those who have gone before me and inspired me to live my life to the fullest. As a new Captain trainee for Envoy Air, I’m very grateful for the opportunity to soon be in command of an Envoy jet. Hired in August 2010, I’m now the current Program Manager for the Bombardier Canadair 700 (CRJ-700) fleet. My service in the United States Marine Corps prepared me for this position working with multiple groups of people from internal company departments to external government and corporate entities. 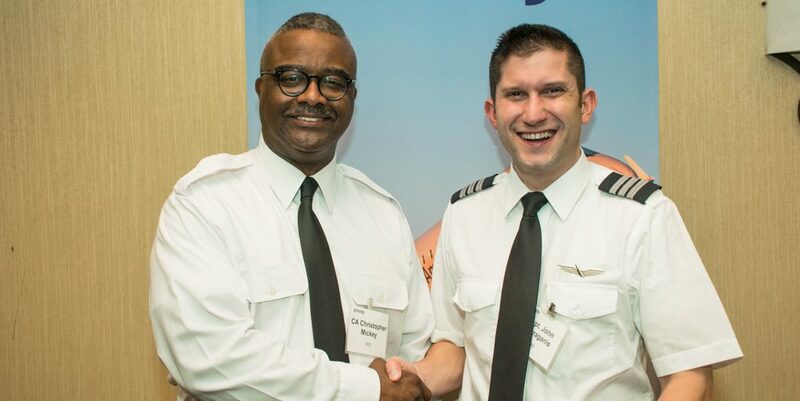 The lessons I learned from my military experience laid the foundation for me to succeed as an Envoy management-pilot by building professional relationships with a very diverse group of aviation professionals. I was originally inspired to fly by my father who owned his own aircraft in Cincinnati, Ohio at a time when African-American aircraft owners were not a normal sight at American airports. Further inspiration and motivation came from well-known military officers like Lt. Gen. Frank E. Peterson (USMC), Gen. Lloyd W. Newton (USAF), Gen. Daniel “Chappie” James, Jr. (USAF), Lt. Gen. Stayce D. Harris (USAF) and Maj. Gen. Charles F. Bolden (USMC/NASA). I’m also a long standing member of the Organization of Black Aerospace Professionals (OBAP) where I served as the Southeast Region Vice President and the Marketing and Communications Officer under the leadership and mentorship of Captain James Gordon (USAF/UPS). I credit my success at Envoy to hard work, dedication and the great people that I have the chance to work with on a daily basis. I believe the spirit of people like Brig. Gen. Noel F. Parrish runs deep in the corporate culture of Envoy. Prior to being promoted to brigadier general, Colonel Parrish was the senior U.S. Army Air Corps officer responsible for training America’s first black fighter pilots at Tuskegee, AL during World War II. Although this experiment was not expected to succeed, Colonel Parrish provided a training environment free from the indignation of the racially segregated South, and ensured that each black pilot candidate had every chance to succeed. Envoy is absolutely no different. As a new hire, it did not take long for me to clearly understand that I was in a Colonel Noel Parrish environment. The CRJ instructors that I came into contact with were extremely professional, fair and very committed to my success. Their expectations of me were to study hard, work hard and give 100 percent every single day of training. The color of my skin was the absolute last thing on anybody’s mind. I believe that much of Envoy’s success can be directly attributed to the fact that we are an inclusive company that respects each other’s differences, and are committed to working together as a team on behalf of each passenger that buys a ticket on American Airlines.